There has been a lot happening since I last updated this home page back in November. The most significant happening, although not really art related ……. was that after just over 30 years of being together, Nita and I finally got married! That was back at the start of December and we spent a fabulous week away staying in one of the old lodges in the Brodick Castle estate on the Isle of Arran. We had magnificent weather the whole week and actually arrived as snow was falling. 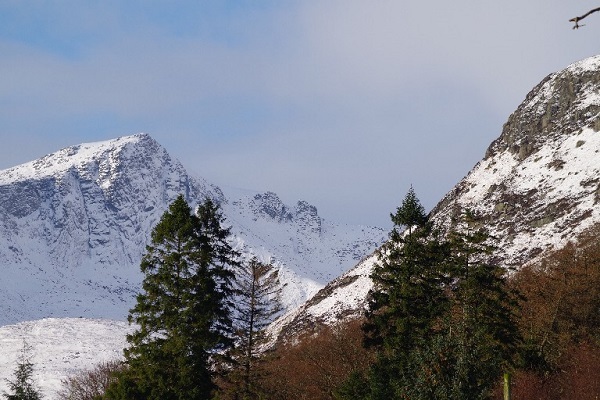 We managed to get several good short walks done, enjoying the cold crisp weather and the amazing views of the snow covered Arran peaks. Since returning to the studio, I’ve completed several new 30 x 30 cm paintings and one of them tries to capture the scene looking into Glen Sannox….see below. Of course, much of my time has been taken up with the larger and more experimental audio paintings. As you know, the first of these, called the Kylesku Project, has been on the go since the summer and in October we were able to test out the partially finished piece for a few days in the magnificent space at the Barony Centre in West Kilbride. The work was only up for a few days, but it gave us a chance to assess how effective the 5.1 soundtrack was and how well it worked with the 120 x 120 cm Kylesku painting. We were all very encouraged by this first test and especially by the response we had to the work from visitors and staff at the centre. It was so positive that we have been invited back to the Barony for a full exhibition early in March. 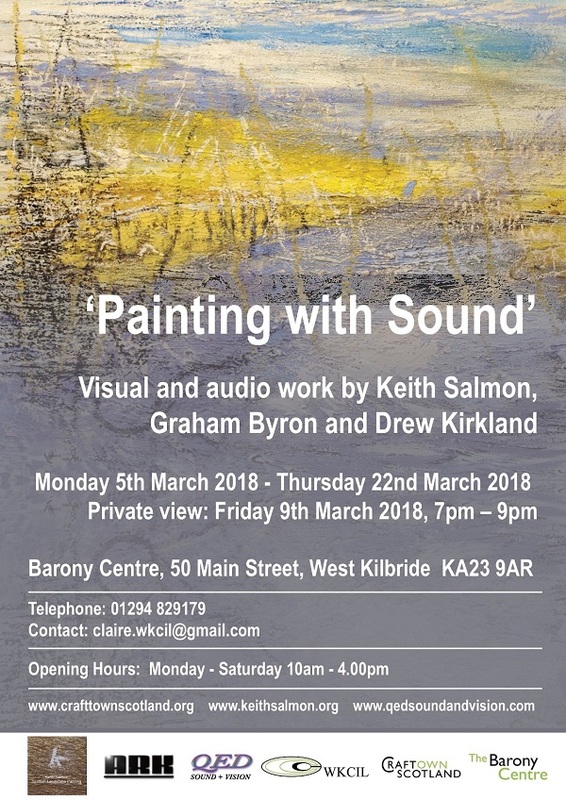 “Painting with Sound” is an exhibition of work by Ayrshire artists and sound engineers, Keith Salmon, Graham Byron and Drew Kirkland. The focal point of the exhibition is the “Kylesku Project”, the trio’s latest audio visual collaboration. 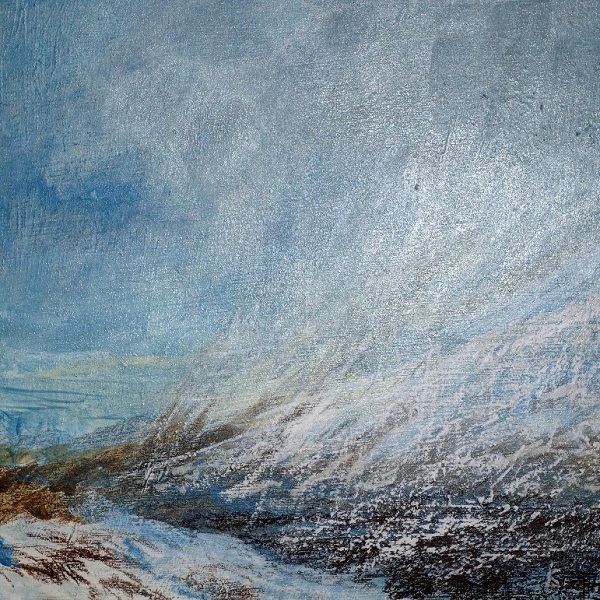 Created from a series of sound recordings made on the shore of the sea loch near Kylesku in Sutherland in May 2017, the work consists of a 120 x 120 cm oil painting, produced by Keith Salmon and inspired by a 30 minute long 5.1 surround-sound track. Engineered and installed by Graham Byron and Drew Kirkland, the sound track will be playing throughout the exhibition and contains sounds from the natural Kylesku environment, sounds recorded as the painter works in his studio and a unique selection of computer generated tones. As a viewer looks at the painting and moves in front of it, different elements of the soundtrack are heard through the five surround-sound speakers. 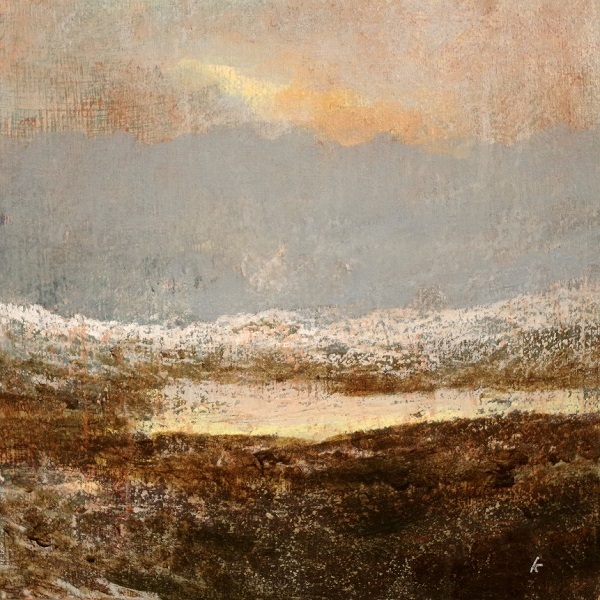 The Kylesku Project is the first in a series of evolving and uniquely Scottish sound / landscapes. 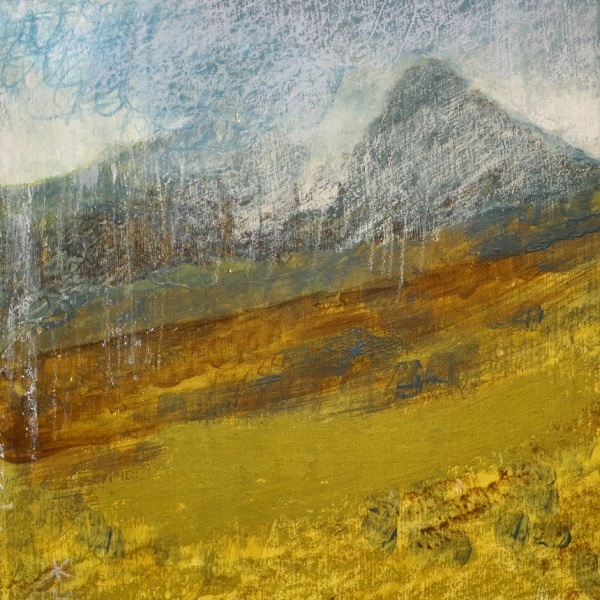 The exhibition will also contain around 25 of Keith Salmon’s Scottish landscape paintings, along with drawing, text, video and projected film footage that will plot the development since 2014 of this new and exciting Ayrshire based audio visual collaboration. Although we are only just about to exhibit the Kylesku Project for the first time, we have already started work on our second audio piece. This will also focus on the dramatic coastal scenery of Sutherland in north west Scotland. A week after New Year, Nita, me, Graham and his wife Tracy, headed up north, aiming for the Stoer Head lighthouse that is situated on the prominent and rugged Stoer peninsular about 10 miles to the north of Lochinver. It’s a wild spot at the best of times and Nita and I had visited it on several occasions in the past. On one such trip last year, we had seen a notice at the lighthouse saying that the two flats adjoining it were available to rent. Now, just for instance, if you wanted to make sound recordings of waves breaking and crashing against huge cliffs…..where would be better? So that was our destination….. both cars arriving at this lonely spot just as the light was fading and the lighthouse was doing its business. It was quite amazing unloading our gear and carrying it up the spiral staircase to the top flat….. with the sound of the waves crashing below. We stayed there for a week, each day heading out, armed with a variety of sound recording equipment and cameras. While Graham organised and set up each of the recordings, Tracy filmed everything so that we had a record of this part of the work for future promotional material. It all worked very well and we were especially lucky with the weather, it not only being dry all week, but also not that windy. On the Wednesday and Thursday it was very nearly calm….. but with a big swell rolling in that made for some great sound! At the end of each afternoon we would retreat to the warmth of the flat and then spend several more hours checking through the sound and film we had recorded. Beer, good food and conversation added to the enjoyment and the week raced by. Before long it was Sunday morning and we were packing the cars for the journey back to Ayrshire. Only then did the weather break and we had to battle our way around the side of the lighthouse in a howling gale to get to the cars! It was certainly a dramatic departure and my final sound recording was made of the wind howling in the stairwell leading down from the flat. We got some very good recordings from the trip and Graham has already edited the film footage Tracy took, into a series of short clips which we’ll be projecting onto a large screen as part of the “Painting with Sound” exhibition. I do hope you can get along to both see and hear our work…. it will, I’m sure, be a very different and hopefully, thought provoking experience.